H.L. (D.) Harbour Launch (Diesel) 56140 -D 49 was the last of her type in service with the ‘old dockyard’, the origin of this type of boat reaches back to the 1850’s and the first of the dockyard steam craft. At that time they were known as Harbour Service Launches designated HSL however in 1942 there was confusion in the designation due to the Royal Air Force High Speed Launches. 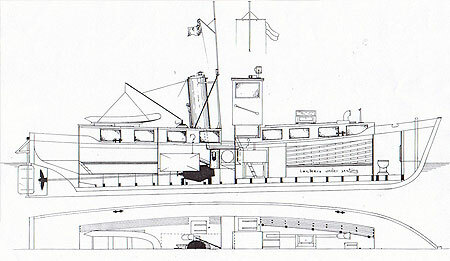 Admiralty Fleet Order 1518 changed the designation to H.L. (S) and H.L. (D) as they are known today. 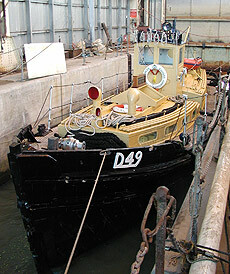 D 49 was obtained by Portsmouth Naval Base Property Trust on 20/03/96 from her previous owners - MoD (N) RMAS Portsmouth. Her intended use is for passenger transport and display. Since being under the management of the PNBT she has undergone two refits the first in March 1996 and the latest completed in August 2001 just prior to the International Festival of the Sea. 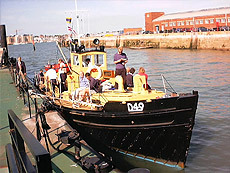 During the Festival she was used to carry guests around the harbour and the visiting ships. 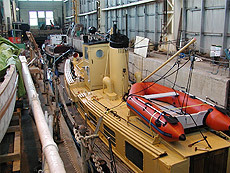 The launch is used by the Trust as a workboat for towing and general services. She provides the overall trust management with an excellent venue to host guests during such events as Cowes week.